The hotel's all-day dining restaurant located at the Lobby Level of Sunway Resort Hotel & Spa welcomes the Chinese New Year festivities with an enticing range of buffet lunch, dinner and customised menu. Admist the Oriental Corner at the buffet offering, diners can indulge in over 25 types of celebratory Chinese delicacies which are on rotation daily such as Roasted Chicken marinated with Black Garlic, Barramundi Belly with Fermented Red Bean Curd Sauce, Traditional Eight Treasure Duck, Deep Fried Soft Prawn with Fragrant Garlic and Chili, Steamed Waxed Meat Rice in Lotus Leaf and many more. 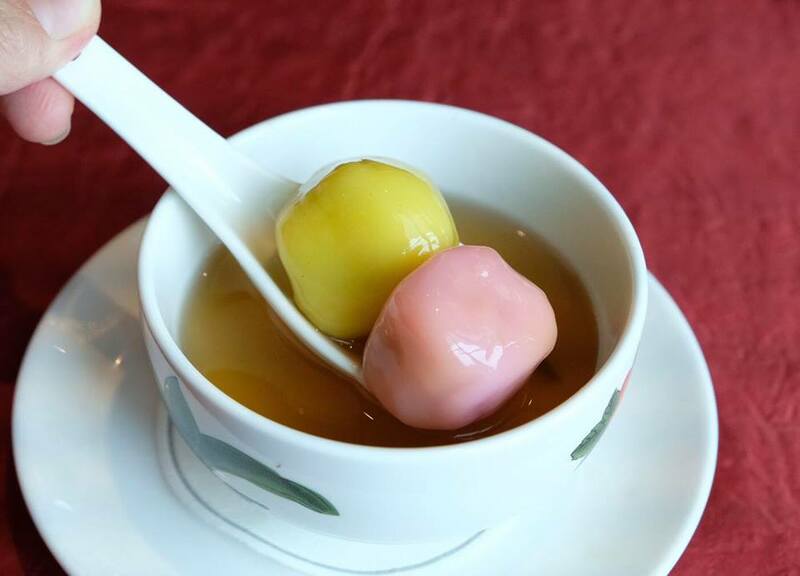 At the dessert section, Sweetened 'Tang Yuen' with Ginger Infused Syrup, Fried and Steamed Nian Gao, Sesame Balls with Lotus Paste, Tradtional Cookies and more will be offered. 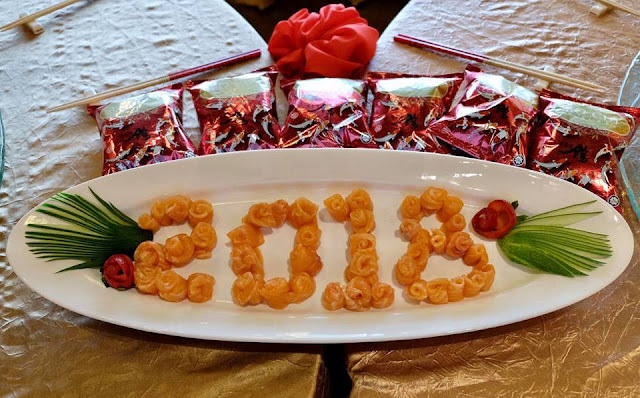 Other highlights include the festive steamboat, available on the dinner buffet spread which will feature 70 condiments to select from and 16 home-made sauces on rotation to dip into along with numerous other toppings. Kick-start the festive celebrations and indulge in an exciting "Prosperity Buffet Dinner" at The Resort Cafe. Be captivated by the different daily selections of nostalgic and traditional Chinese dishes, which are part of the 25 speciality highlights on rotation on the buffet. 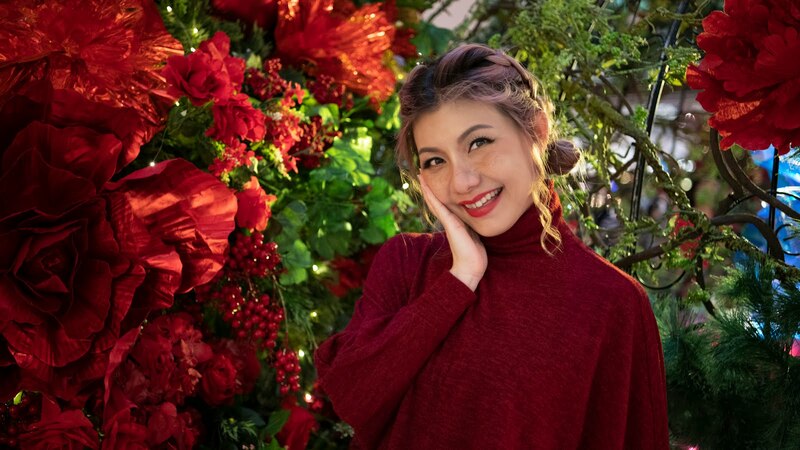 The pre-festive dinner buffet available from 6.30pm to 10.30pm is priced at RM138 nett per adult, RM98 nett per senior citizen and RM78 nett per child. Gather your family and loved ones for a special and memorable reunion dinner on the eve of the celebration, as the Chefs have prepared a sumptous spread for the occasion, with dishes that feels just like home. 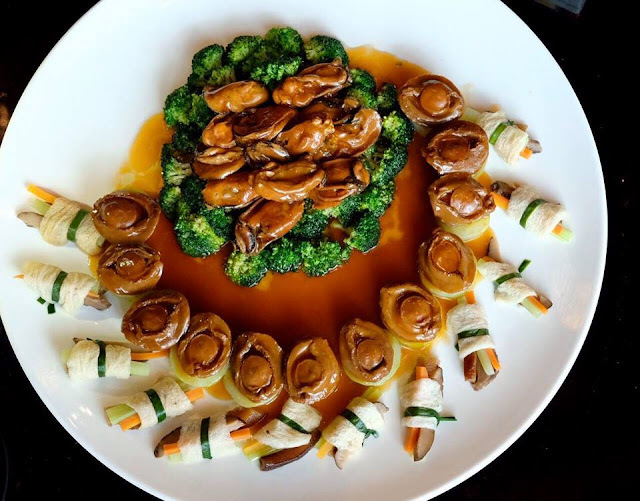 These dishes include the customary Traditional Eight Treasure Duck that combines three type of Mushroom, Glutinous Rice, Chestnut, Diced Chicken, Carrot and Lotus Seed placed into the duck and stewed for two hours. The Reunion Buffet Dinner available from 6.30pm to 10.30pm is priced at RM148 nett per adult, RM98 nett per senior citizen and RM78 nett per child. 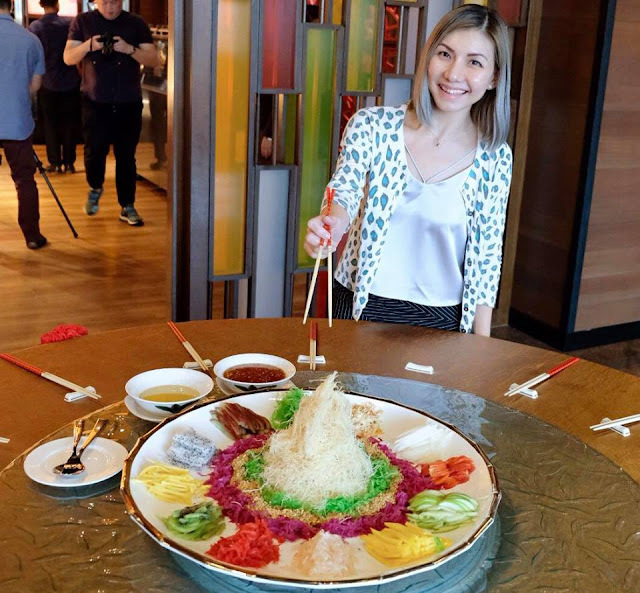 For those who preferred a roundtable reunion, The Resort Cafe offers two set menus which are priced at RM1,688 nett (Treasured Blessings) and RM1,888 nett (Auspicious Spring) per table of 10 persons respectively. Some of the highlighted dishes in the set menus are the Steamed Dragon Trout with Minced Ginger and Garlic in Superior Soy, Alaska Scallop and Homemade Tofu with Vegetables, Steamed Pearl Loong Fu Pan Fish Head & Belly with Minced Garlic Chili Sauce, Braised Abalone with Hokkaido Dried Scallop in Cucumber Ring and Homemade Tofu and Steamed Waxed Duck Meat Rice in Lotus Leaf. 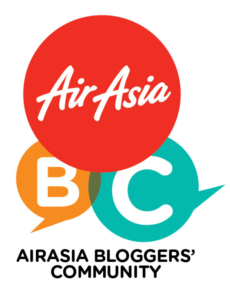 Hurry, book now! The Resort Cafe is able to accomodate up to nine tables of 10 persons only. 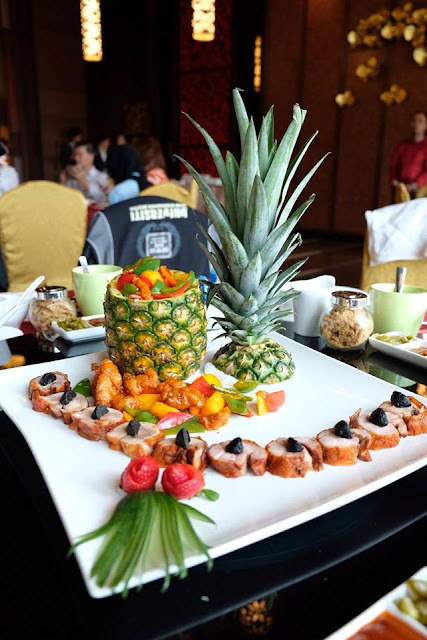 For larger and a more private reunion, diners can opt to dine and host the dinner in the hotel's function rooms. 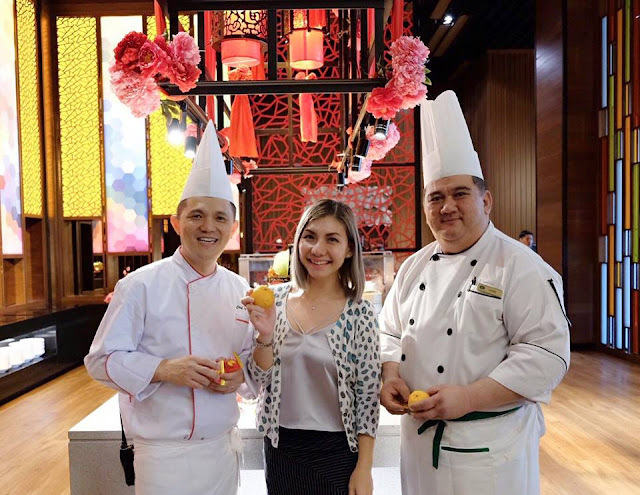 Two eight course set menus, priced at RM2,100 nett (Jade Prosperity) and RM2,688 nett (Golden Abundance) per table of 10 persons respectively. 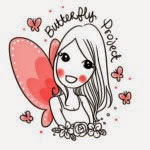 A minimum confirmation of five tables of 10 persons will be required. 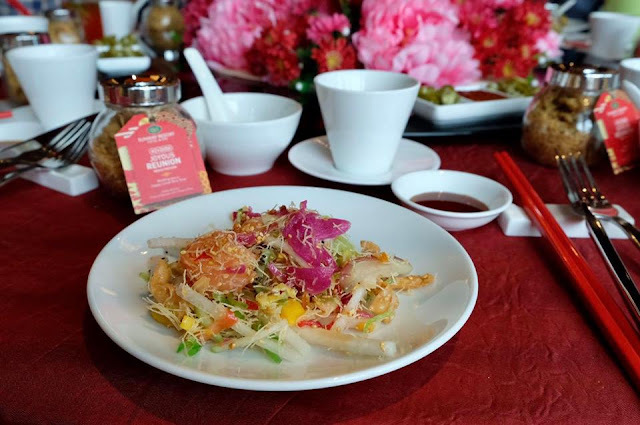 Available for both dine-in and takeaway, The Resort Cafe's Yee Sang are freshly prepared daily with a selection of either the signature plum dressing or Thai sauce. Diners can enjoy up to six different variants of Yee Sang which includes the Fruit (vegetarian), Traditional Salmon, Abalone Clams, Crispy Fish Skin and Jelly Fish, Soft Shell Crab and a special option this year - Fruit and Salmon Yee Sang, topped with Kataifi (thinly shredded crispy dough) for an added texture in every bite. 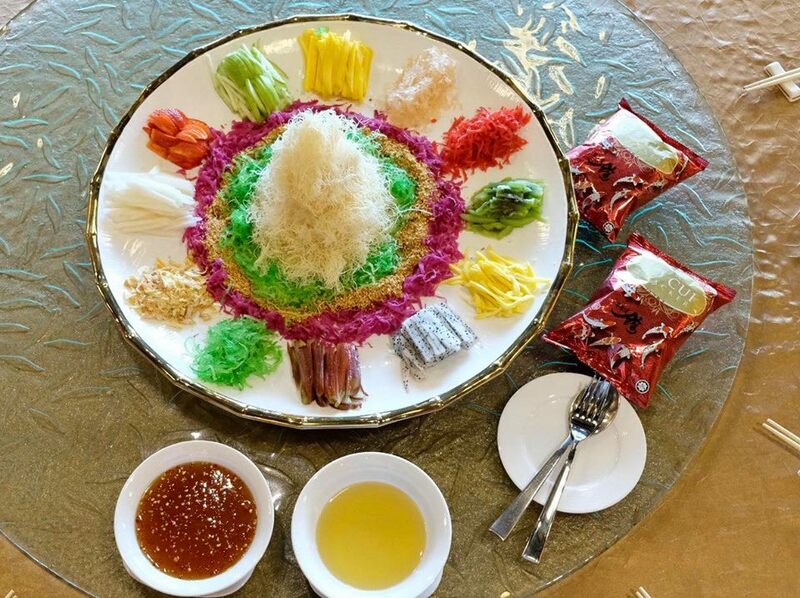 The Yee Sang price ranges from RM118 to RM178 for full portion and RM68 to RM98 for half portion servings. The fruits gives the yee sang a refreshing zing while the Thai sauce adds a subtle spicy kick, truly one of the best yee sang I've had. 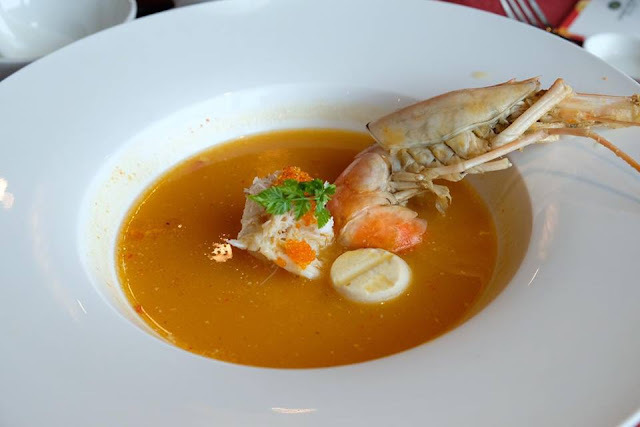 The flavourful broth was rich and packed with fresh and succulent seafood goodness. 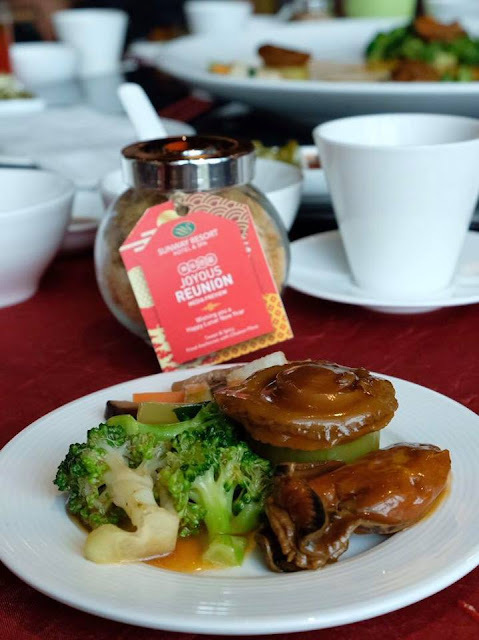 The sweet and sour chicken was really delicious, crispy on the outside and succulent on the inside while the juicy and tender roasted chicken marinated with black garlic has a whole new depth of flavour. 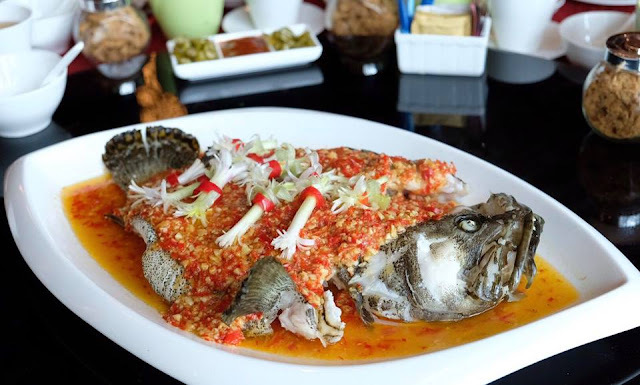 Superb fresh, the fish was firm in texture and heavily laden with the slightly pungent garlic chili sauce. Braised to perfection, the abalone was flavourful and tender, but I am especially enjoying the broccoli, soft yet firm enough to bite. 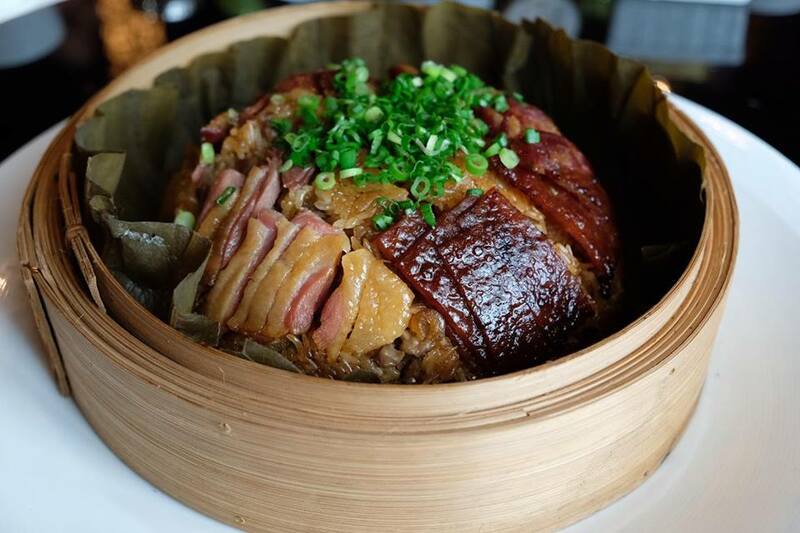 The rice was good and aromatic, generously laden with an abundant of waxed duck meat and BBQ dried chicken. For those who planning for a stay at home celebration with your families and friends, a selection of roasts by Chef Sam are available from 2 February to 3 March 2018 for takeaway which includes the Roasted Smoked Chicken and the Roasted Black Garlic Chicken, available at RM118 nett per portion and the Roasted Duck at RM138 nett per portion. Each roast adequately serves six to eight persons. Lastly, don't forget to catch the showcase of Chinese New Year Lion Dance performances on Friday 16 February 2018, on the first day of the celebration at Sunway Resort Hotel & Spa's Main Lobby at 8.30am. Guests will be in for an amazing performance as six lions will perform energetic jumps and move to the loud beat of the drums symbolic for reigning in good fortune, success and prosperity.